Why would people travel from around the world to CEIMG for AM surgery? That is an excellent question for anyone who is looking into receiving care for this condition. To be honest, we are incredibly humbled and honored to have been asked to care for and help change the lives of patients born with AM. To date, we have served patients from nearly every continent (Antarctica being the only outstanding continent) and from many states across the US. Being one of the only places focused on AM in the world, the desire for patients and their families to get the most specialized care for this challenging condition has allowed for over 1,000 surgical cases to be performed to date. In many areas of the world, canal surgery has been discouraged due to poor outcomes among local surgeons. It is our experience, however, that with extreme attention to detail, state of the art equipment and facilities and a dedicated team, atresia repair can and does produce excellent, long-lasting results in properly selected patients. Through a rich and long history of practice in the treatment of AM, Dr. Roberson has pioneered several techniques and strategies that translate to improved results for patients. It is our experience that nearly every ear can hear – the question is “how” to achieve that goal for each child. Traditionally, microtia repair was performed first and included 3-4 separate surgeries. After microtia repair was complete, ear canal surgery could then be performed. It is well known in human development that stimulation of a sense during a critical period of development is crucial to the development of that sense. In a challenge to the current traditional medical practice at the time, Dr. Roberson was the first to perform ear canal surgery before microtia repair. He pioneered this early intervention in order to provide hearing to the developing brain and language centers of children with AM at a time when maximal stimulation may occur. Prior to this change, the average age of atresia repair was over 9 years of age – a time where a majority of the brain development associated with language has already passed. The first publication of this work occurred in 2009 in several peer reviewed medical journals and can be seen here. This change was directly facilitated by the medpor technique for microtia repair and also reduced the total number of surgeries needed from 4 to 2. Our patients were very happy with this reduction in the number of surgeries, travel, time away from home, psychological impact, etc. Several patients asked if both surgeries could be performed at one time. 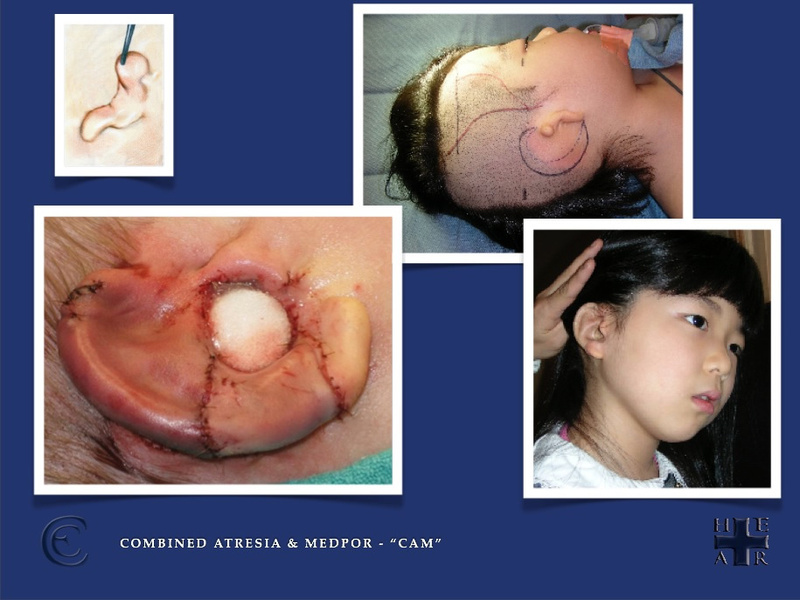 After several years of experience with canal surgery first followed by medpor as a second surgery, Dr. Roberson, in cooperation with Dr. John Reinisch, performed the first Combined Atresia Microtia (CAM) surgery in the world in January 2008. Having completed over 110 CAM surgeries with Dr. Reinisch and over a dozen with other surgeons, it is commonplace for patients to select this option for AM repair. The CAM procedure offers several advantages over traditional techniques and comes with drawbacks as well. We are the only ones performing this surgery in the world at this time. The list of possible complications that can occur with atresia surgery has led many doctors across the world to abandon surgery for AM altogether. It has been our practice to address areas of previously common complications with a goal of improved, permanent surgical outcomes. One such area is the skin transplanted from another site on the body used to line the new ear canal or outer ear reconstruction. Historically, skin for atresia surgery has been taken from the leg, buttocks, arm or abdomen. The skin quality of these areas is vastly different than that of the normal ear canal skin. These donor site areas have been and still are frequently associated with deformities where this practice is still being used, as demonstrated in these images. As detailed in this publication we see that the best-proven graft site for atresia surgery is from the scalp. Skin from the scalp is an excellent match for the ear canal skin, hurts very little and heals incredibly quickly. The skin taken is so thin, the hair follicles are not disturbed, allowing hair to grow back completely and leaves the site essentially invisible after healing. Another common challenge to atresia surgery has been the joint between the 2nd and 3rd middle ear bones, where the connection should be bone on bone. Frequently, this is not the case with atresia as scar tissue replaces the connection between the two bones. As you might imagine, vibration coming through the bones from the eardrum can be lost, causing a hearing loss. In some cases, the middle ear bones can be replaced with a middle ear bone prosthesis, developed by Dr. Roberson. The CEIMG team has been the first to report this finding and the solution. In 13% of patients, reconstruction of the middle ear bones is needed because of the malunion that exists. In some cases, the malformation can be seen prior to surgery on the CT, but in most cases this finding is not known until we are in the operating room. This specialized area is being heavily studied by Drs. Roberson and Balaker. Several medical specialties must cooperate and coordinate care for AM patients. Audiologists, Plastic Surgeons, Craniofacial Surgeons, Otologists, Anaplastologists, and others routinely must be in communication with each other in order to define the best course of treatment and its timing. We have developed a classification outline using the acronym HEAR MAPS to facilitate communication among professionals. This classification also allows us to compare treatment types among similar patients enhancing our ability to improve treatment protocols over time. Dr. Roberson has been involved with most implantable solutions for AM from their development stage forward. Our center offers all implantable solutions for AM and is experienced in their use. This is a very quickly developing area of treatment and is important to understand and know as you choose the best treatment for you or your child. Please see the Treatment section of this site for those devices currently available. Cholesteatoma is a collection of skin trapped in the area the ear canal should occupy. In 4% of patients we evaluate, a cholesteatoma is present and must be addressed before it causes destruction or damage to surrounding structures. Left untreated, disability and even death may result from injury or spread of infection. Cholesteatoma This is a very rare condition best treated in a center with a large volume of cases. Frequently, physicians with limited experience with AM may not know how to evaluate or treat a cholesteatoma. Atresia repair and jaw distraction can be performed simultaneously in some instances. Because HFM can affect the airway, obstruction of the airway at night can lead to poor breathing and low oxygen concentrations in the bloodstream, a condition called Obstructive Sleep Apnea (OSA). World recognized experts in treatment of OSA are present and available to patients at CEIMG in the California Sleep Institute. See our sister site: http://www.calsleep.com. New protocols are in place for other challenges that have typically surrounded AM surgery, such as narrowing of the ear canal after surgery and eardrum lateralization. We continue to improve and refine both our techniques and protocols and desire to share those with others to improve the care of atresia children worldwide.